When my mother died she had an old case filled with all sorts of paper bits and pieces she had collected over many years. One of the slips of paper was the one shown above - a recipe for Impossible Pie. I'd never heard or seen such a pie previously, but perhaps it is known in other countries. One of the things mum often said from when I was a child was that, "It's only impossible when you are dead." This was when I was moaning about having to do something or other that looked difficult. Another saying was words to the effect that everything would work out okay and would fall into place at the right time. Of course, as a child this never seemed realistic. But mothers know best. Okay, some of the time, but like the Impossible Pie things do fall into place in life - if we follow the recipe. It's also true that nothing is impossible. 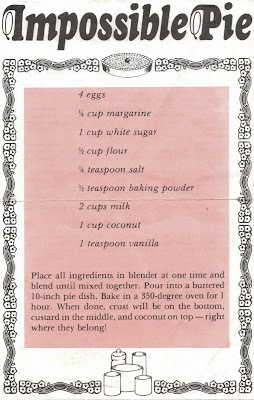 Place all ingredients in blender at one time and blend until mixed together. Pour into a buttered 10" pie dish. Bake in a 350 degree oven for 1 hour. When done, crust will be on bottom, custard in the middle, and coconut on top - right where they belong! Top 10 Posts For April: Ghosts, Messages from The Dead, Coincidences, White Doves and Feathers, Reincarnation etc. Your mother sounds like a very cool lady. If even the impossible pie isn't impossible, then nothing is! Probably a dumb question but do you melt the margarine? 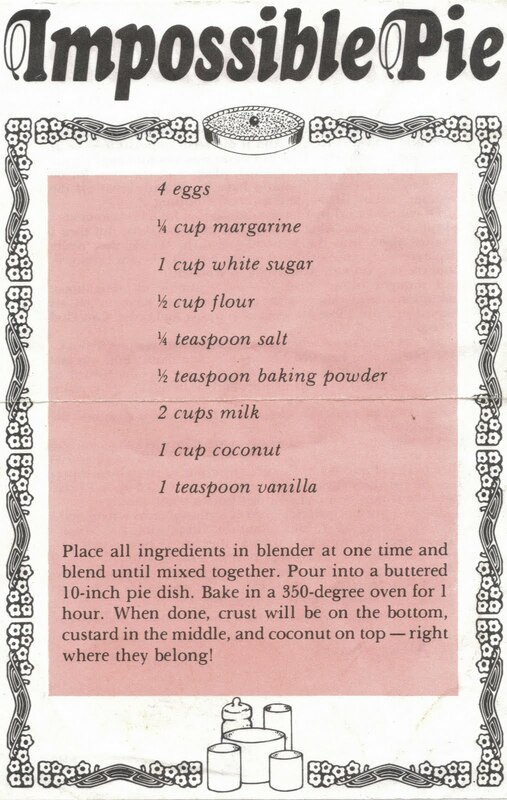 I used to make something like this using a recipe with/from Bisquick....how cool to have a "scratch" recipe for it! Anyone tried it, does it work? Mike I love the recipe and I do feel that I've heard the name before, now I have the recipe to go with it, thank you! I love her quote, "it's only impossible when you're dead" and am adding it my repertoire:). My son will be tired of hearing this in no time!! Great post and thanks again!